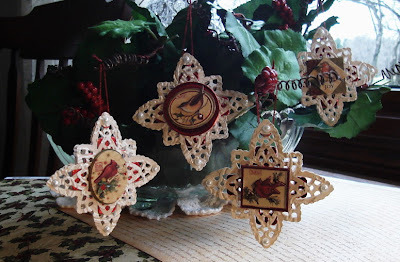 Vada's Blog Stamp Inks and Paper : Tis The Season for Christmas Ornaments and Cards. 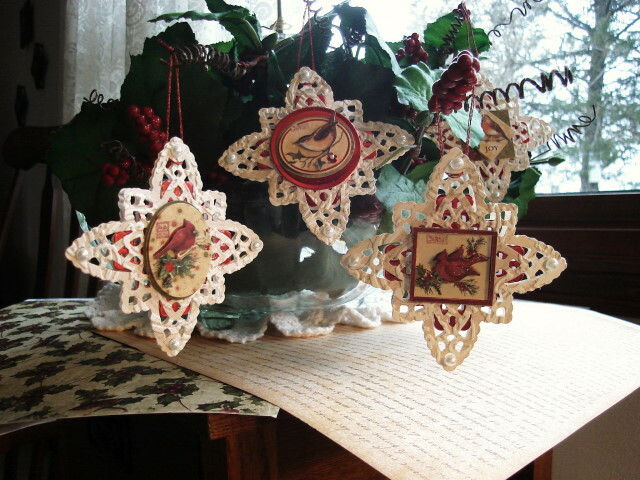 Tis The Season for Christmas Ornaments and Cards. I have never tried ornaments, have made tags for the tree, but never ornaments. So here’s my attempt at ornaments. some distress inks a few stamps this is what I came up with, hope you will enjoy them. Oh My! These are so BEAUTIFUL Vada! Awesome design! They will look spectacular on your tree! Gorgeous ornaments! Love the die cut background piece! Vada, these ornaments are just gorgeous! Love the lacy look with the images! So sweet! Hope you are having a great weekend! BTW, I have a blog candy link on my blog, so stop on by, even if you can't comment! wow wow wow~ gorgeous ornaments!